Södertuna Castle - Cozy 17th Century Conferences! Welcome to a real castle! Södertuna Castle in Gnesta, 40 km south from Stockholm, stands in a magnificent 18th century style and allows the conference to be vaulted by a historic site. Next to Frösjö beach edge, this conference facility is ready for the 21st century meetings. A workplace then, a meeting place now. Where the conference guest gets to sleep during the night at Södertuna Castle, then in one of the aircraft's pilgrims with admirable views of nature's underneath. The rooms are pleasantly furnished and create a dear environment resembling living with a good friend. 70 rooms can accommodate a total of 139 sleeping guests. Duke Karl Sal is a spacious meeting room, up to 150 people can sit in the cinema and it can also be adapted for different seating. 6 conference rooms and 3 smaller meeting rooms are on site. In the kitchen area at Södertuna Castle you live for culinary experiences. Ingredients come from producers close up, and the beautiful surroundings may play their part in the world of chefs too. In Bakfickan, the the group will enjoy hanging out and enjoying in a unique environment. The old stable has become bar! There is plenty of space to arrange nice conference activities around Södertuna Castle. From simple walks and hiking tours to skeed shooting and cross-country skating in the winter. At the lake, you can ride a canoe or ride a speedy RIB boat for example. Only 45 minutes car drive from central Stockholm, you will find this little paradise in the countryside. Water, forest, and land awaits the company, which focuses on the work it has come to complete. The castle is 3 km from Gnesta. 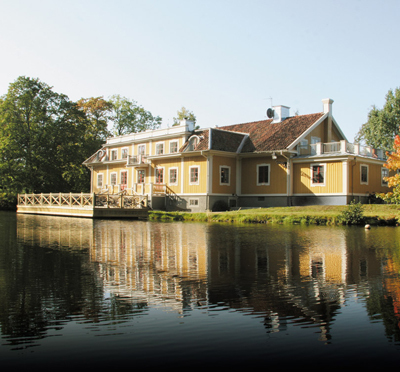 Have you been to Södertuna Slott and want to give your own comments?